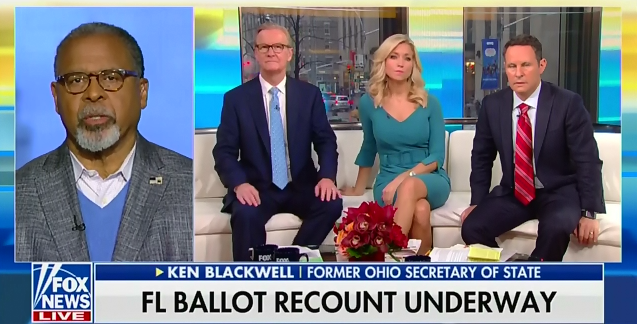 Continuing their effort to cast doubt on the ongoing vote recounts in the Florida Senate and gubernatorial elections, Fox & Friends hosted Ken Blackwell, a member  of President Donald Trump’s now-defunct Advisory Commission on Election Integrity, to complain about the recount process. But Blackwell himself regularly  sought  to curtail access to the voting booth in his former capacity as Ohio secretary of state. Blackwell told Fox & Friends that election officials need “transparency” and “penalties” to restore confidence in Florida’s recount process “and get rid of folks who violate the standards. Three strikes and you're out.” But in his former role as Ohio secretary of state, Blackwell was accused of multiple attempts to suppress the vote, such as allegedly “failing  to provide voter registration opportunities in public assistance offices as required by the National Voter Registration Act,” and even rejecting  “1000s of voter registration applications due to paper weight.” His office also repeatedly leaked  voters’ Social Security numbers when he was running for governor in 2006 -- all before he was named to Trump’s election fraud commission. KEN BLACKWELL (FORMER OHIO SECRETARY OF STATE): I think they’re going to look to the secretary of state to be in the lead, but the attorney general of Florida has a role, as does the governor. Look, the bottom line is that we cannot allow an election to be corrupted behind -- by hiding behind the veil of gross incompetence. And so that means that there are some steps that we have to take: One, we have to clean up -- Florida has to clean up, as are other states are doing, their voter rolls. We have to make sure that folks who are deceased are taken off the rolls -- folks who have moved from the state are taken off the rolls in the state that they have left. We, in fact, have to make sure that there are standards of transparency, and they must be enforced. BRIAN KILMEADE (CO-HOST): But, Ken, you know about Broward County. You sued them, right? Your organization sued them. You could have called this ahead of time. BLACKWELL: Well, look, but that -- that's the point. You have to have eyes on the process. Transparency, and as I’ve told many people, you, Brian, the other week, you know, “Those who want to do evil love the darkness.” We have a responsibility to make sure that our system, in a bipartisan way, has eyeballs on all of the process, at every step of the process. That is so, so important. And this, this -- this notion, that you can have chronic, massive incompetence that is excused -- that corrupts a process. That lowers confidence in the results, and it breeds distrust. STEVE DOOCY (CO-HOST): Ken, real quickly, give us one thing Florida -- in particular, Broward County, perhaps -- should do to fix it? BLACKWELL: Transparency. Transparency, transparency, and get rid of folks who violate the standards. Three strikes and you're out. That’s baseball, and that's criminal justice system. Three strikes and you're out. Broward County, this person has had many strikes.